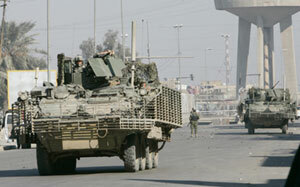 U.S. convoy in Baghdad January 22. Another 3,200 U.S. soldiers have been deployed in Iraqi capital as part of Washingtons plan to send 21,500 more troops to Iraq. WASHINGTON, January 24More U.S. troops have begun moving into Baghdad, as part of Washingtons plan to escalate the war in Iraq by deploying an additional 21,500 troops to the Iraqi capital and nearby Anbar province. The first brigade, some 3,200 members of the 82nd Airborne Division, has arrived. Despite partisan rhetoric of opposition to the White House plan, bipartisan support for the imperialist wars in Iraq and Afghanistan remains strong. Over the last week, U.S. forces and Iraqi government troops arrested a top aide to Shiite cleric Muqtada al-Sadr during a raid in eastern Baghdad. Some 600 members of al-Sadrs militia, the Mahdi Army, have been reportedly arrested in similar raids. Washington is targeting the group along with Sunni militias and others it considers obstacles to establishing a stable regime in Iraq thats subservient to U.S. interests in the region. As we go to press, Iraqi and U.S. troops conducted a series of raids on Haifa Street and elsewhere in Baghdad aimed at such militias. This is the same area where U.S. forces said they killed 50 people in a similar January 9 raid. The bloodshed caused by the imperialist occupation, and fighting among Iraqi bourgeois factions vying for a bigger share of power, has escalated. At least 100 Iraqis died in car bombings January 22 in two markets near Baghdad in predominantly Shiite neighborhoods. Iraqi health minister Ali Hussein al-Shamari estimated that 150,000 Iraqi civilians have died as a result of the war since the 2003 U.S.-led invasion. A United Nations report said that more than 34,000 Iraqi civilians were killed last year. Meanwhile, two nonbinding resolutions being discussed in the Senate critical of the troop escalation highlight how strong bipartisan support for the war is. The latest by Republican John Warner is cosponsored by Republican Susan Collins and Democrat Benjamin Nelson. Democrats Hillary Clinton and Evan Bayh, and Republican John McHugh, have offered a proposal in the Senate to cap U.S. troops in Iraq at about their current number of 130,000. Clinton and Bayh also sent a letter to U.S. defense secretary Robert Gates requesting that Washington dispatch an additional 2,300 troops to Afghanistan. In a January 19 raid, U.S. and Iraqi government forces arrested Abdul-Hadi al-Darraji, a top aide to al-Sadr. A spokesman for Iraqi prime minister Nouri al-Maliki criticized the raid. Coordination with the Iraqi political leadership is needed before conducting such operations that draw popular reactions, stated Sadiq al-Rikabi. The premier has a major base of support among al-Sadrs forces. The U.S. military said it has carried out 52 operations against al-Sadrs militia in the last month. Another 42 attacks have targeted Sunni militias. In his January 23 State of the Union speech, U.S. president George Bush said such assaults also target alleged Iranian activities inside Iraq. Shia extremists, Bush said, receive support from Iran. Bush also asked Congress to authorize an increase in the size of the Army and Marines by 92,000. Troops out of Iraq, Afghanistan now!